DAY 1  Pick up from the Kigali Airport off flight KQ580, arriving at 5:20pm. After clearance of customs/immigrations formalities, our representative (look for sign with your name) will transfer you via road to Ruhengeri Town (approximately 2 hrs drive) which will be your main base for gorilla trekking. Dinner and overnight KININGI LODGE. DAY 2  Following a very early breakfast, set off for the Pare National Des Volcans which offers Gorilla tracking in the Park. Lunch at Munhaburu Hotel. Then drive to Gisenyi Town on the Lake Kivu shores (1 hour drive). Dinner and overnight at LAKE KIVU SERENA HOTEL (Formerly IZUBA HOTEL). DAY 3  Following a very early breakfast, drive back to Ruhengeri (1 hour drive with breathtaking scenery). Arrive in time for Parc National Des Volcans 2nd Gorilla tracking experience visiting another family. Lunch at the lodge. Later in afternoon drive back to Kigali. Dinner and overnight at UMUBANO HOTEL. DAY 4  Following a late breakfast and check-out, your guide will meet you (time to be determined) for your airport transfer. Check-in time 11:00am for Kenya Airways KQ581, departing 12:25pm, arriving Nairobi 4:25pm. Following clearance of customs/immigrations formalities, our representative (look for sign with your name) will transfer you to The Stanley Hotel. Overnight THE STANLEY HOTEL B/B basis. DAY 7  Following breakfast, and check-out, you will be driven across the Great Rift Valley escarpment to Maasai Mara Game Reserve arriving in time for lunch. During the next three days, you will have the opportunity to explore this great reserve in depth. 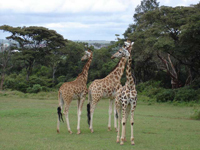 You will see elephant, giraffe, prides of lion, and thousands of impala, topi, Grant’s and Thompson’s gazelle. The Mara is the scene of annual migration of millions of wildebeest up from the Serengeti plains in search of water and grasses. Overnights at SEKENANI CAMP with all meals, and game viewing activities included. DAY 8  Full day game viewing activities Mara. Overnight SEKENANI CAMP with all meals, and game viewing activities included. DAY 9  Full day game viewing activities Mara. Overnight SEKENANI CAMP with all meals, and game viewing activities included. DAY 10  Following breakfast and check-out, transfer to the local airstrip for your charter flight to the Musoma from where your Tanzanian Driver will then drive you to the Serengeti. Arrive in time for Lunch. The Serengeti is Tanzania’s most famous park. It too is the scene of the great migration which begins in June of each year and consists of millions of wildebeest and zebra in search of food and water. You will have two days to discover this magnificent park which encompasses 5,600 square miles. Overnight MBUZI MAWE CAMP with all meals, and game viewing activities included. DAY 13  Following breakfast and check-out, you will be driven via road to the Ngorongoro Crater. Proceed to Ngorongoro Serena Lodge where you will arrive in time for lunch. 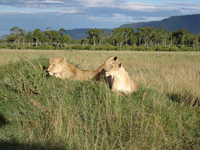 Overnight NGORONGORO SERENA LODGE with all meals, and game viewing activities included. The Ngorongoro caldera shelters the most beautiful wildlife haven on earth. The Maasai and their cattle co-exist with the wildlife in this area, and visitors are able to appreciate their ancient interplay between wildlife and man. The crater measures 16 miles wide/long, and 1,600 to 2,000 feet deep. It has been noted that if there were 8 natural wonders of the world this would most certainly have the distinct honor. DAY 14  Full day game viewing activities. Overnight NGORONGORO SOPA LODGE with all meals and game viewing activities included. The Ngorongoro Sopa Lodge is located on the rim of the crater. All rooms have a magnificent view of this natural wonder. With all meals and game viewing activities included. DAY 17  Following breakfast, and check out, you will be met by your driver and transferred to Nairobi. During your transfer you will stop a couple of curio shops to satisfy your shopping needs. In Nairobi we have arranged a day room at the STANLEY HOTEL. Lunch on your own. Evening transfer to Nairobi International. Check-in time 9:35pm, for Emirates Air flight 722 departing 11:35pm, for Dubai. Transportation in a chauffeur driven 7-seater minivan with pop-up roof for easy game viewing & photography. Charter flight Maasai Mara/Musoma, Tanzania. All arrival and departure transfers in a minivan/4x4/cabstar. Two-way long-range high frequency radio communication. On safari accessories in each vehicle: - First-aid kit, wildlife books, beanbags for easy photography, a pair of binoculars, cool box and fire extinguisher.